Add simplicity and style to your bird garden with the Heartwood Valerie Ann Bird House. The square frame of this home lends a classic look to the piece, while the flared verdigris roof covers the structure. A decorative, cast iron finial tops the roof for added appeal. The 1.5" diameter entrance hole is inset into the PVC body, and a larger hole surrounds the entryway for a bit of protection from the elements. A wide edge around the perimeter of the home offers perching for your birds, helping them prepare for takeoff. A removable copper disc on the back of the unit enables regular nest checks and cleaning. 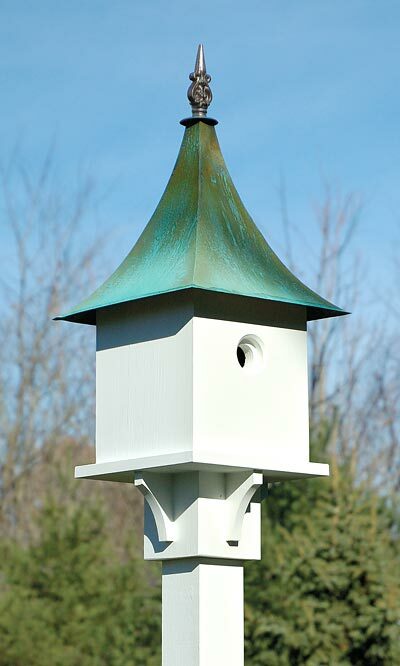 The white hue of the cellular PVC construction adds a clean look to the item, and the verdigris finish on the copper roof provides an antique feel. The top of the house has gaps between it and the roof, to keep the roost ventilated and prevent birds from overheating. The innovative post pocket enables the home to be mounted on a 4 x 4 post (not included) for ease in installation. Welcome songbirds into your garden with this Valerie Ann Bird House. Made in the USA.